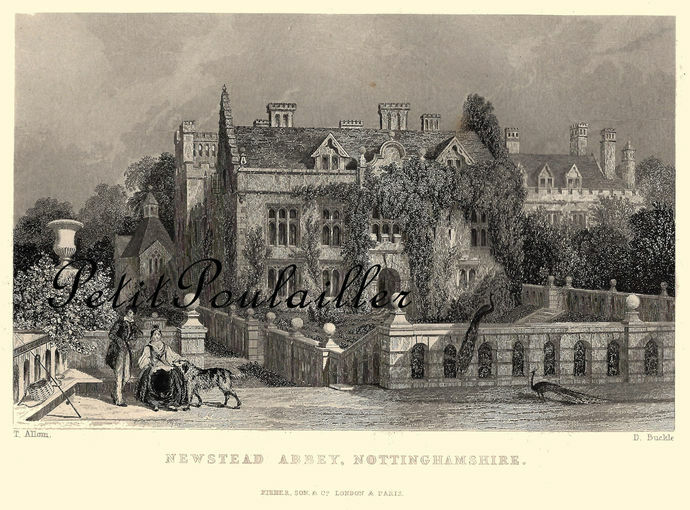 From the 1858 Art Journal Yearbook, here is a beautifully engraved landscape featuring Newstead Abbey, Nottinghamshire, England, home of Lord Byron. 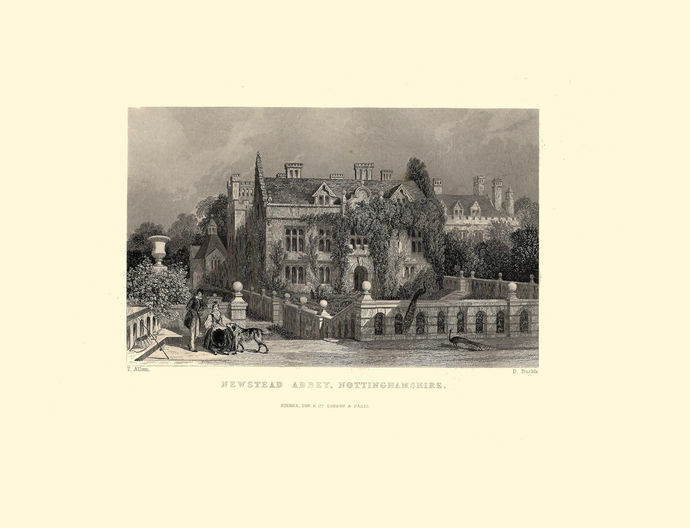 The Abbey was founded as a monastic house in the late 12th century, and to this day the house retains much of its medieval character. The most famous survival is the iconic West Front of the church that dates from the late 13th century and is now a scheduled ancient monument. Inside the house are the medieval cloisters, Chapter House (now the Chapel) and a collection of medieval stone carvings and manuscripts. 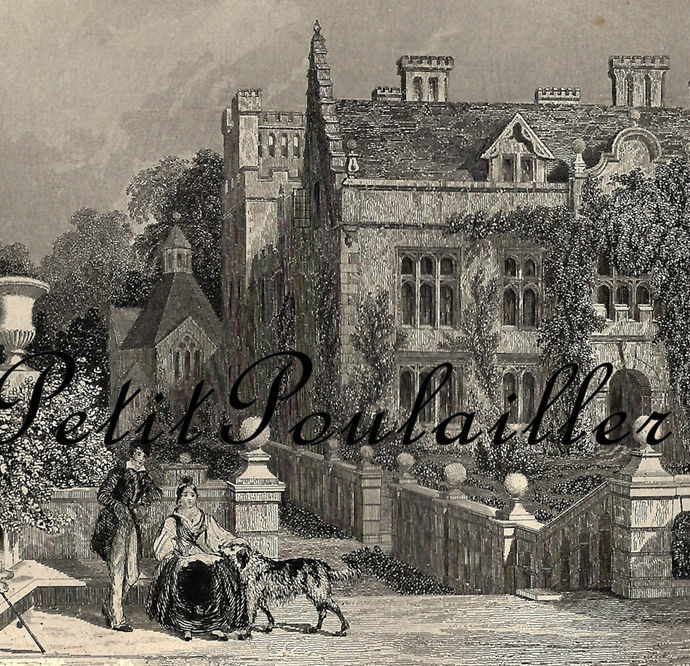 The walled grounds are wonderfully captured, with peacocks posing for the engraver, and a couple I think is meant to be Byron and his lady love (along with Byron's beloved Newfoundland hound, 'Boatswain') standing at the grounds' entrance. 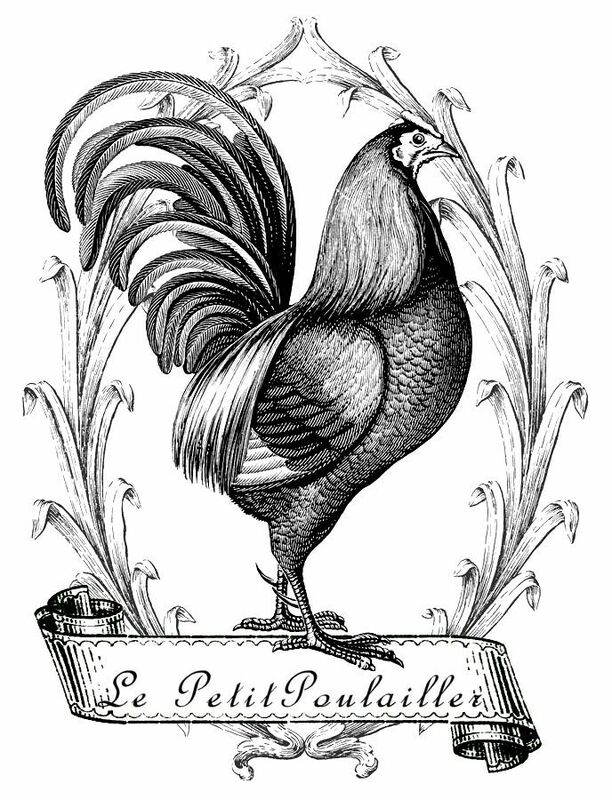 The engraving is clear and beautiful with little foxing to betray its age. The heavy paper, almost card, is blank on its reverse, measures 8" x 10.625" (20x27 cm), the engraving itself measures 4" x 6.125" (10x16 cm). There are no folds, tears, creases, or marks. A classically beautiful piece to frame - for the bath, dressing room, library. Or perhaps this will find its way into your art? You are purchasing an original 1858 paper and it does not have watermarks. I will send this to you flat, protected, and by USPS 1st Class mail.